The dollar-coin sized ultrasound patch is more transparent than not, and from a few feet away, some of its geometric patterns are visible, but not identifiable. The researcher responsible for the invention grins as he holds it up. “It’s a sensor,” he said, and proceeds to bend and twist it until it’s nearly completely folded. Then, he sticks it on his wrist and checks for some data. Despite its small stature and unprecedented flexibility, at just several millimeters thick, the patch promises to be a powerful tool because it combines tasks that now require bulky and intrusive equipment with a flexible, easy-to-wear patch. For nano-engineer Sheng Xu, the man behind the invention and engineering professor at the University of California, San Diego, its bite-sized power sometimes even amazes him. “It still works!” he proclaimed with steady delight, after showcasing his most recent model. Now that’s (literally) a stretch. Xu has been assembling tiny components — batteries, sensors, and now ultrasounds — for much of his career, yet his designs have a marked difference from most sensors: flexibility. They can be stretched, bent, twisted and deformed, while still working to measure and collect data well below the visible surface. That’s a tricky thing to accomplish. While nano-engineers across industries have developed smaller electronics and circuitry over the last decade, the encasing has remained rigid to protect the technology inside. 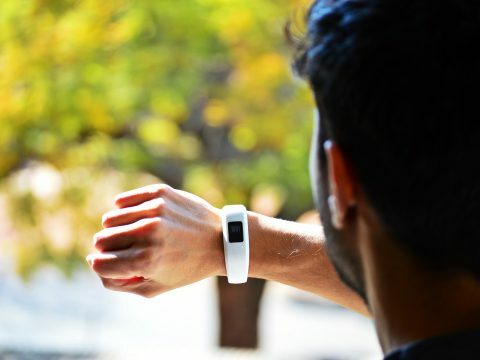 Distinct separate components, including power source, memory, core function and communicating data (like your wearable activity tracker) are typically assembled in rigid packages that simply get smaller as the components do. The capabilities of Xu’s micro-technology have sparked rethinking of the wearables marketplace. “This device actually opened up a new dimension for the range of these wearable devices,” said John A. Rogers, founding Director of the newly endowed Center for Bio-Integrated Electronics at Northwestern University. 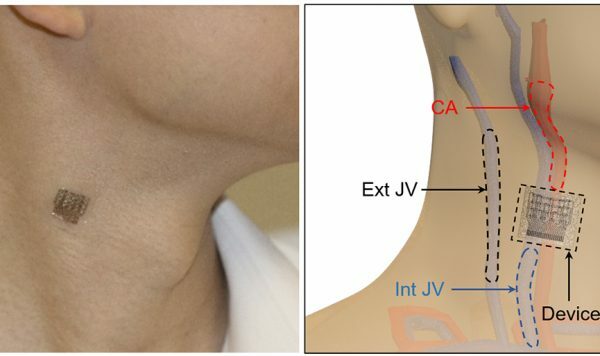 Rogers, a pioneer in flexible electronics himself, as well as other areas — materials science and engineering, biomedical engineering, mechanical and electrical engineering, chemistry, and computer science — believes the comfortable wearable and the use of ultrasound will allow in-depth monitoring for medical conditions. For example, ultrasound enables a deep blood-pressure reading that previously could only be done in an inpatient setting. Rather than providing basic information through a standard blood-pressure cuff or skin monitor, ultrasound-powered readings give doctors far more information, such as what arteries are doing and how fast blood is moving. That’s important in determining heart health and has been historically difficult to do outside of medical facilities. This year, MIT named Xu one of its 35 Innovators Under 35. The renowned university’s judges liked the bendable aspect of the patch, but even more so, they applauded the way Xu’s team went to existing technology and figured out how to build a better container for it. “We started with commercially available commodities and used novel design and fabrication to make them into a wearable geometry,” Xu said. Yet during the newest development phase, Xu recounted, the challenge was to put the electronic components into softer material that might react differently to stress. Without a harder casing, the fear was that brittle connections would break and components that shouldn’t touch would collide. In essence, things wouldn’t be adequately contained or connected. To overcome these hurdles, Xu and his team had to place individual electronic components into cells of protective gel, floating them like eggs in a layer of silicone — the part that stretches and bends. Four layers of this circuitry make up the mini patch, part of what Xu calls an island-and-bridge technique. “We have an array of islands that can accommodate those rigid building blocks, and we use those wavy serpentine wires to connect them like bridges and wire them up to provide system-level electrical function,” he explained. The team uses lasers to carve holes between the protected components and the wiring between them. The serpentine wires themselves look like a tiny copper Slinky, which can stretch to 3.14 times the diameter of each loop. 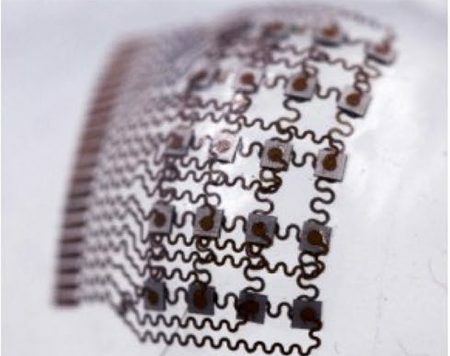 The longer wiring allows the wafer to withstand significant bending and twisting in tests, helping researchers to use the ultrasound generated by the wafer to collect deep and subtle blood pressure information and draw an accurate, in-depth view of a patient’s cardiovascular health. With more than a five dozen published papers that have been cited nearly 8,000 times, Xu nonetheless cheerfully admitted past failures. If it’s at all hard to follow Xu’s explanation, that’s because he is a pioneer in the field. And he’s just warming up. The patch is still in development, but Xu and his colleagues are already starting to think about mass production and other potential uses for the flexible technology. Because they used existing, proven components as building blocks, Xu believes the cost of production will be very reasonable and the stretchy patches can be made through roll-to-roll manufacturing, screen printing, or even 3-D printers. In addition to supporting the healthcare field, Xu and his colleagues are also working on using the ultrasound patch to look at defects in structures that can’t be easily inspected, such as engines, bridges, and buildings. He noted that his team includes a broad group of researchers from different fields, including equipment engineering, materials science, chemistry, physics, radiology and cardiology, structural engineering, and advanced computer science. 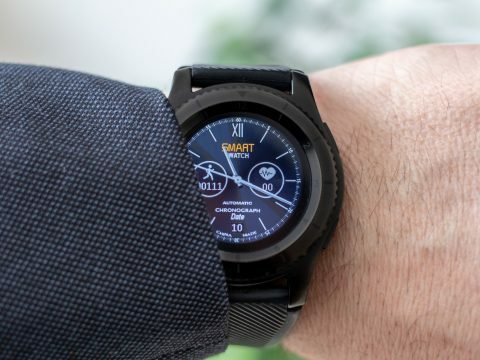 Smartwatch makers are beginning to monitor biomarkers — from heart rate, glucose, and oxygen levels to toxins and other physiological signs — to detect and predict serious medical episodes. 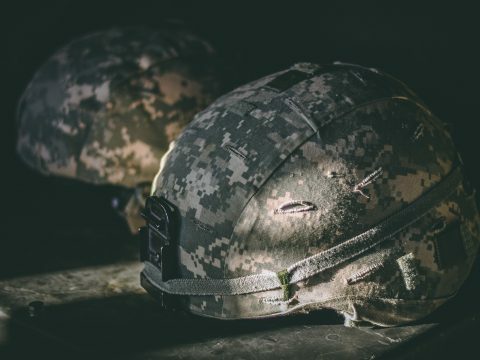 It’s due to the seriousness and prevalence of psychological afflictions veterans face that researchers at the Massachusetts Institute of Technology (MIT), among others, are collaborating with the VA to find tech solutions to aid with veteran reintegration. Data from the Federation of the Swiss Watch Industry shows that after a two-year decline in global watch sales,the industry is now recovering.